For nearly three years, global attention has focused on the three arrows of Japanese Prime Minister Abe Shinzo’s “Abenomics” as well as his aggressive new security policies. Yet beneath the radar, his government has begun to vigorously promote renewable energy and efficiency. Its initiatives accelerated over the summer of 2015, and the momentum continues to increase. The measures include not just ample fiscal, regulatory and other policy support for renewable generation and energy-harvesting technology. The Abe regime is also investing heavily to build a renewable-based hydrogen economy as well as expand the smart-grid and district heating systems that are core network infrastructures for a low-carbon economy. Moreover, the Abe regime is adopting new governance mechanisms, including inter-ministerial task forces and widening the ambit of local public corporations, to accelerate the deployment of renewables. In addition, de facto energy policymaking is becoming more inclusive, eroding the Ministry of Economy Trade and Industry’s (METI) dominance while simultaneously advantaging pro-renewable factions in other ministries as well as within METI itself. The present article argues that the dismissive approach overlooks important fiscal, organizational and other evidence, which we shall explore below. The LDP’s green-energy proponents aim at revitalizing local economies through renewable energy, growing strategic sectors of the economy, bolstering national security (especially energy security), enhancing resilience in the face of natural and other disasters, as well as dealing with the threat of climate change. Their ranks include such LDP heavyweights as Ishiba Shigeru, current Minister for Local Revitalization and possibly the next LDP President. 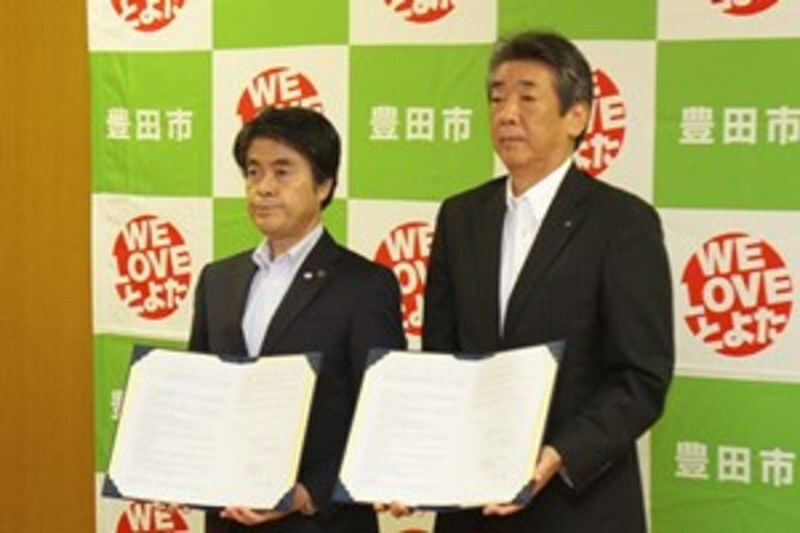 Given their conservative politics, they are elaborating a national-security, “local revitalization”-focused paradigm of green power, quite distinct from the idealistic, small-is-beautiful emphasis common among Japan’s left-liberal proponents of renewable energy. Yet the LDP’s approach to diffusing renewables also centres on local-government agency, which could not only accelerate the diffusion of renewable energy but also bolster Japanese democracy in the bargain. In light of the alarming state of global climate change, energy markets, and economic inequality, this article asserts that what the LDP are doing is far too important to ignore. Some of the most persuasive evidence of the LDP’s expanding commitment to renewable energy and efficiency is found in the central government’s budget, particularly the central agencies’ requests for the coming fiscal year (April 1, 2016 to March 31, 2017). During the summer of 2015, Japan’s fiscal process was notable for energy-related requests that mushroomed over the previous year. One standout example is the Ministry of Environment’s (MoE) submission for renewable energy and efficiency projects, which is fully 62% higher than its fiscal year 2015 spending.5 We shall explore these and related requests in greater detail presently, comparing them with budgets under the DPJ. But first, it is important to point out that these budget outlines are preliminary. In Japan’s fiscal process, central agencies submit their initial budget requests to the Ministry of Finance (MOF) by the end of August, which is followed by negotiations among MOF’s budget examiners and the various ministries and agencies. These negotiations generally last until about December, and result in a draft budget. It is likely that about YEN 5 trillion will be trimmed from the YEN 102 trillion budget request. But according to an analysis in the September 5, 2015 Asahi Shimbun these cuts are likely to be centred on social security.6 It is highly unlikely that the Abe cabinet did not approve the dramatic increases in proposed spending on renewable energy and efficiency, and thus they are probably not going to be sacrificed. As described above, the MoE’s energy-related fiscal request for 2016 was 62% higher than its fiscal 2015 initial budget. The MoE’s total request for 2016 was YEN 1.68 trillion, a 33% increase over the fiscal 2015 appropriation. One of the factors driving this overall increase is the Japanese government’s commitment to reducing its carbon emissions by 26% by 2030 versus 2013 levels. As a major part of this overall aim, the MoE’s renewable and efficiency-related spending requests for 2016 amount to just under YEN 176 billion. The MoE is, of course, not the only central agency with a prominent role in directing public finance at renewable energy and efficiency projects undertaken by Japan’s local governments, private firms, NPOs and other actors. The METI is another major supplier of subsidies for such projects. In the energy field, the METI’s requests for 2016 total just under YEN 976 billion. This figure is a significant increase on the YEN 796.5 billion in the fiscal 2015 initial budget, and efficiency and renewables receive striking increases. To be sure, one of Japan’s leading journalists on energy-related matters, Ishida Masaya, criticizes the METI’s fiscal 2016 request for including about YEN 200 billion in spending on nuclear (including YEN 133 billion in support to local sites of nuclear reactors). This figure is roughly the same as the nuclear spending in fiscal 2015, which totals YEN 185 billion. Ishida regards maintaining this level of support for nuclear as being inconsistent with the new (from 2014) energy basic plan’s explicit commitment to maximize renewables and minimize nuclear. Was the DPJ More Renewable-Friendly than the Abe Regime? The recent budget requests, described above, are not the entirety of the Abe regime’s planned investments in renewables, efficiency and related projects. There are several other central agencies – such as the Ministry of Education, Culture, Sports, Science & Technology (MEXT) – whose programmes are important. Even so, these preliminary budget numbers for 2016 offer an instructive contrast with Japan’s central-government fiscal expenditures on renewable energy between 2009, the first year of the DPJ government, and 2013, the first year of the Abe government. Those expenditures were analyzed in an October, 2014 report by the Board of Audit of Japan, which surveyed renewable energy subsidies by Japan’s 7 main central agencies (METI, MoE, MAFF, MLIT, MEXT, the Cabinet Office, and NEDO). Some of its findings are presented in table 1, which displays the 7-agency totals for each year between 2009 and 2013, in addition to the total over the five years. The survey found that total spending on renewable energy deployment by the 7 main central agencies for the entire 5 year period was YEN 468 billion, with 56.7% of the spending, or YEN 265.6 billion, represented by METI, followed by MoE at 16.6%, or just under YEN 78 billion. As we also see in table 1, the peak year for renewable spending under the DPJ was 2010, when a total of YEN 134.8 billion was devoted to renewable-energy projects by the 7 central agencies. This figure was nearly double the previous fiscal 2009 total of YEN 70.7 billion. The gap between the two figures suggests that there was a strong contrast between the LDP, under whose government the 2009 budget was drafted, and the DPJ. The DPJ was committed to nuclear prior to 3-11, but it also included strong advocates of renewable energy.20 Hence, we should not be surprised at the increase. Yet note that under the current Abe regime, the fiscal 2016 request for renewables by the METI alone totals YEN 81.8 billion. The figure would be considerably greater were we able to take the Board of Audit of Japan’s approach and add the MoE and other agencies’ and ministries’ slated spending to that of the METI. That calculation will have to await the passage of the 2016 budget, early next year. But the numbers at present strongly suggest that the LDP in 2015 has changed quite strikingly in its approach to renewable energy, compared to 2009 as well as 2013 (when the LDP intervened late in the budget cycle to reshape fiscal priorities by increasing public works).21 At least on some measures, the LDP of 2015 may even be more pro-renewable than the DPJ was. As we shall see below, institutional changes undertaken by the Abe regime are also increasingly important in promoting renewable energy and efficiency. Virtually none of these changes have caught the attention of the regime’s many critics or even the many business analysts hoping to divine Japanese policymakers’ intentions on energy policy. Admittedly, recent official Japanese government policy decisions concerning mid-term targets for nuclear, renewables, and other power generation would seem to indicate an LDP coolness towards renewables. 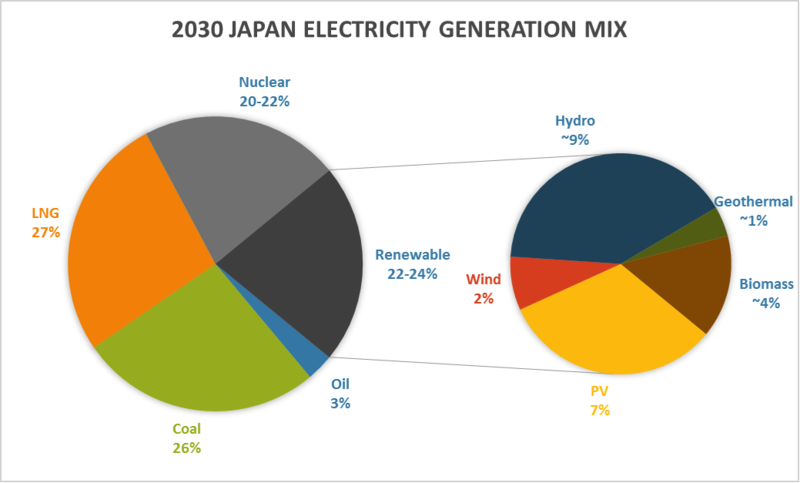 That is, on June 1, 2015, the METI released its targets for Japan’s “best mix” of power generation for 2030. This report supplements the April 2014 Basic Energy Plan, which lacked specific targets. As seen in figure 1, the new targets for 2030 include securing between 20-22 percent of total power by nuclear generation. Other elements of the projected 2030 power mix include a 27 percent share for liquid natural gas (LNG), 26 percent for coal, and 3 percent for oil. Political calculations are often like that, which is one reason America’s Obama administration has professed an “all of the above” energy strategy27 while making incremental moves to marginalize coal and maximize renewables. But Japan has minimal conventional energy resource endowments and a deeply delegitimated nuclear fleet. In order to “keep the lights on,” while limiting costs and risks, it has to grapple with tough choices that restrict its ability to finesse for long in day-to-day power policy as opposed to targets 15 years away. And unlike the Obama White House, which is part of a fragmented federal system with no clear locus of effective authority on energy, the buck stops at Japan’s central government. The cabinet is thus compelled to make fiscal and institutional choices in the here and now. So it is no surprise that the Abe regime’s political compromise on the power mix is belied by the fiscal and institutional initiatives we examine in this article. So consider where Japan is. The country has just adopted mid-term energy targets that few find credible. It has also done this in the midst of enormous uncertainty on conventional energy supplies, prices, geopolitics and other factors. It bears keeping in mind that Japan is not just the world’s fifth-largest power market, but also the world’s largest importer of LNG, the second largest importer of coal, and the third-largest net importer of oil and oil products.32 Figure 2 on “Changes in Japan’s Power Mix” shows that the country’s import dependence on conventional fuels to produce power greatly increased between 2010 to 2013, when nuclear’s share shrank and LNG’s role ballooned from 29.3 percent of power to 43.2 percent, coal increased from 25 percent to 30.3 percent, and oil and liquid petroleum gas (LPG) more than doubled from 6.6 to 13.7 percent. Virtually all of these fuels are imported, so Japan’s import dependence increased dramatically, from 62 percent in 2010 to 88 percent in 2013. The comparison with the average EU power mix in 2011 is striking, as the EU’s overall dependence on imports is 49 percent. Figure 2 shows that Japan in 2013 was even more import dependent than it was in 1973. That was the year of the first oil shock, which is still such a benchmark for vulnerability among Japanese policymakers that – as noted earlier – the METI emphasizes it in its fiscal and regulatory planning for efficiency and conservation and indeed uses when it produces figures (figure 2 is a direct translation of METI’s work). 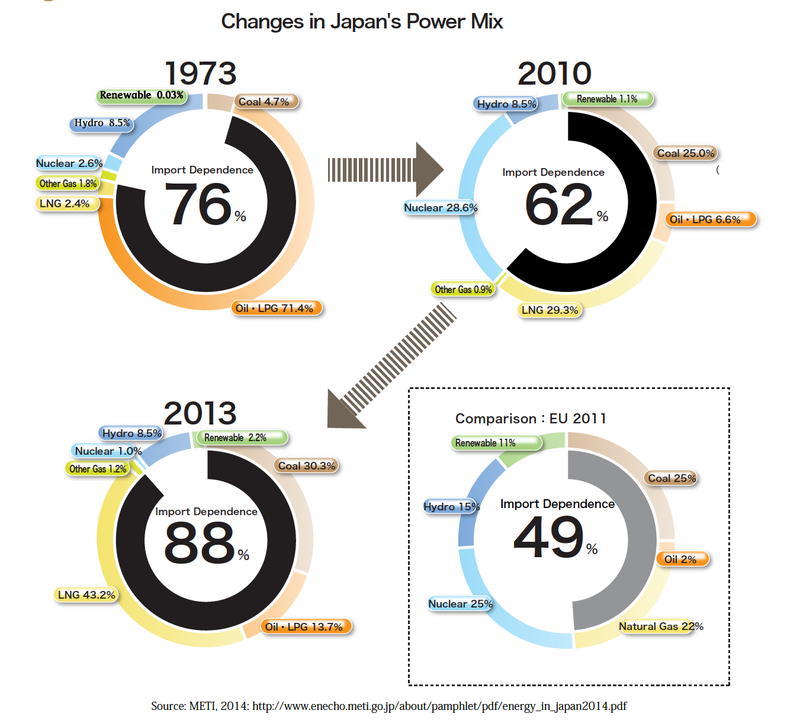 Admittedly Japan’s power mix in 2013 was less dependent on a single energy source, in contrast to the over 70 percent dependence on oil and LPG in 1973. At the same time, the geopolitical, climate and other risks of using fossil fuels in the present far exceed those of 1973. These projects will help relieve pressure on the FIT, whose costs are already up to about YEN 1 trillion in 2015, or roughly YEN 350/month per household, based on an average household power charge of YEN 7000. This burden is not enormous, but it is a significant increase over the 2012 cost of YEN 190 billion (YEN 87/month per household).42Measures that expand non-intermittent renewables while also not further burdening the FIT and extant transmission infrastructure make eminent sense at any time. But they are especially valuable when vested-energy interests are still keen to suppress the diffusion of distributed, renewable energy. Another aim of such projects is to expand the local-government role in power and heat businesses. As the MoE’s Environmental White Paper of 2015 pointed out, in a detailed survey of the city of Minamata, local energy demand is roughly 8% of the local economy. The MoE underscores the fact that most of the local-area money spent on energy (power as well as fuels) flows to the regional power monopoly and other external suppliers, including overseas sources of fossil fuels.43The MIC and other agencies have been collaborating to remedy this, taking advantage of the upcoming (April 2016) deregulation of Japan’s retail power markets as an opportunity to expand the local public corporations’ role in energy as well as otherwise maximize local returns from energy. They are well aware that the more local public corporations enter the power economy, the greater the access to finance for infrastructure, the more effective is lobbying pressure in the face of the power monopolies, and the more equitable the energy shift (since local public corporations represent the local community). The policy streams involved in this overall initiative are quite numerous, and come under such rubrics as “disaster-resilient community building,” “local revitalization,” “national resilience,” “distributed energy,” and several others. Indeed, while following Japan’s 2015 fiscal process as it related to energy projects, it proved useful to read an August 7, 2015 research report, titled (in Japanese) “Local Economic Revitalization Via the Comprehensive Use of Renewable Energy.” The report, by Fujitsu senior research analyst Watanabe Yuko, argues that Japan is in the midst of restructuring its policy support for renewable energy. 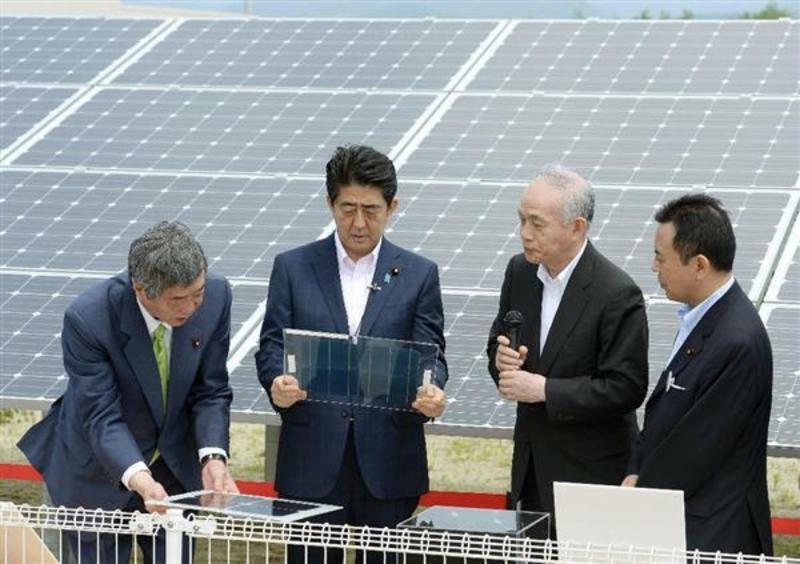 Watanabe detailed the problems ensuing from the fact that, in the four years since 3-11, Japan’s deployment of renewable energy has focused almost entirely on solar power. The FIT incentive system that was adopted in the wake of 3-11 and came into effect from July 1 of 2012 has – as of the end of March 2015 – subsidized the deployment of 8263 kW of solar power generating capacity. This is about 95% of total renewable power generation capacity supported by the FIT. Wind, geothermal, biomass and other forms of renewable power generation are supported by the FIT, but the highest level of support is given to solar power. 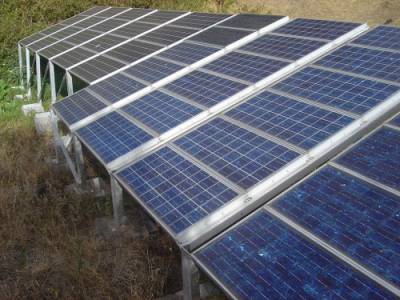 In addition, solar power is relatively quick to install. The result is that solar projects have received the bulk of private-sector investor attention. However, from 2015, policy changes saw the FIT’s special tax measures eliminated, together with deep cuts in the support for solar power. Subsidization rates for solar power projects above 10 kW dropped from YEN 40 per kilowatt in July 2012 to YEN 27 per kilowatt in July 2015. In addition, from mid-2014 the power monopolies argued that they were facing grid stability problems, and began en masse to reject applications to the power grid.44 In consequence, the FIT power purchase guarantee was amended to allow extended periods during which the utilities may, pleading capacity limits, refuse the purchase of FIT-sponsored renewable energy. Watanabe’s analysis suggests that the increased business risk is likely to strongly undermine the incentives for installing large-scale solar power. Watanabe’s report also points out that significant endowments of renewable energy resources are distributed among local areas. Solar and wind are very attractive to private-sector businesses because installation times are short and thus it is possible to earn revenues from the FIT quickly. At the same time, the initial investment costs of these installations are high and it is not easy to arrange the financing. Therefore, the projects tend to be initiated by large businesses. As a result, local areas have limited capacity to participate in planning projects and to derive returns from them. Local governments extend various tax exemptions and other special measures to attract private-sector renewable projects, but the local area’s direct economic benefit is in fact rather small. By contrast, biomass has a very strongeconomic impact on the local area. Local sourcing of the raw materials, such as wood thinnings, delivers a stimulus to the local farming and forestry industries. 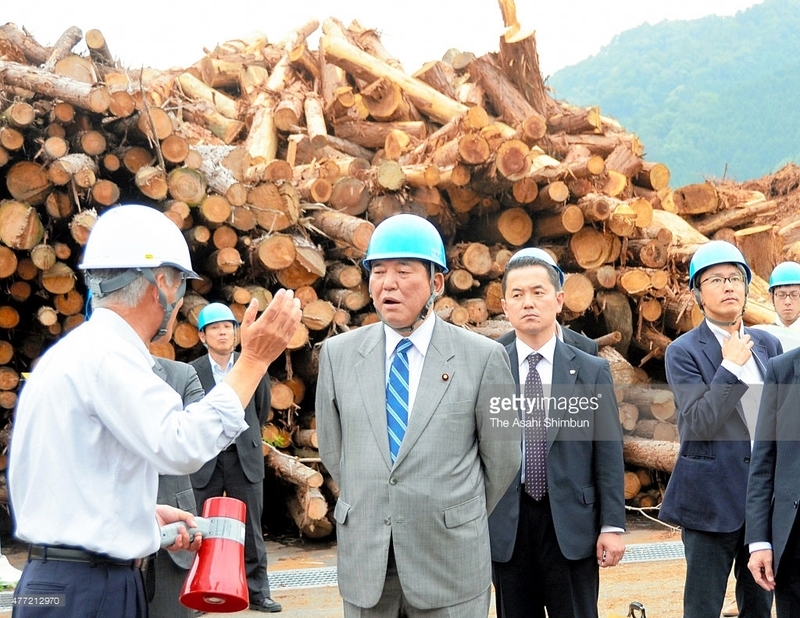 Watanabe points out that Japan’s potential for biomass is very high. The country has roughly 6 billion cubic metres of forestry resources, among the highest in the world. It also has ample supplies of biogas throughout the country, via waste products from livestock as well as leftover food resources and the like. In addition, biomass projects are more efficient and make better use of otherwise wasted heat (from combustion) the more localized they are. Admittedly, developing biomass projects takes time as well as significant investment. On the other hand, because they are based on local resources and the demand for the energy generated is permanent, returns are not subject to the vagaries of the economic cycle and prices of imported energy. In addition, and probably most important, the local area itself can be the central player in planning. As of August 26, 2015, the LDP Policy Affairs Research Council (PARC) made this policy approach official. The LDP “Committee on Expanding the Diffusion of Renewable Energy” drafted a proposal for “A Strategy of Local Revitalization Via Renewable Energy: Local Abenomics.” The Committee is chaired by the LDP Dietmember (and former MIC Vice-Minister) Shibayama Masahiko. Its proposal is quite detailed and emphasizes the value of the broad portfolio of renewable options (including the gamut of heat sources) to local revitalization at a time when Japan’s YEN 18 trillion power market (in 2013) is being deregulated. The submission emphasizes that even the official 2030 power-mix figure of 24 percent renewables equates to a YEN 4.3 trillion business, while 30 percent is YEN 5.4 trillion. The PARC approved the submission on August the 25th and then submitted it to Chief Cabinet Secretary Suga as well as the central agencies of government. Moreover, Japan is already making headway on setting up local energy businesses. In 2013, the above-noted MIC program for district heating systems and other decentralized energy infrastructure selected 31 local communities for a survey of their energy potential. In 2014, 14 of these communities that had been deemed to have a high potential for decentralized energy development were selected. In both cases, the emphasis was on developing energy businesses thatfocus on the community’s internal demand for power and heat as the focus of local renewable energy projects. Another aim is to develop highly autonomous energy systems that are robust in the face of disasters and other potential disruptions to the conventional grid. 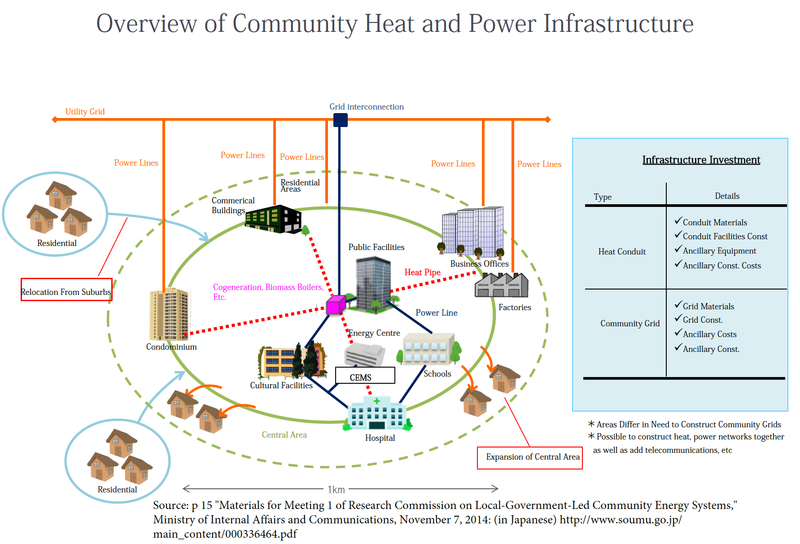 Figure 3 on the “Overview of Community Heat and Power Infrastructure” illustrates the generalized model that MIC seeks to deploy in Japan’s local communities. As the figure shows, the systems include smart power and heat grids linking local community government facilities, businesses, and residences. 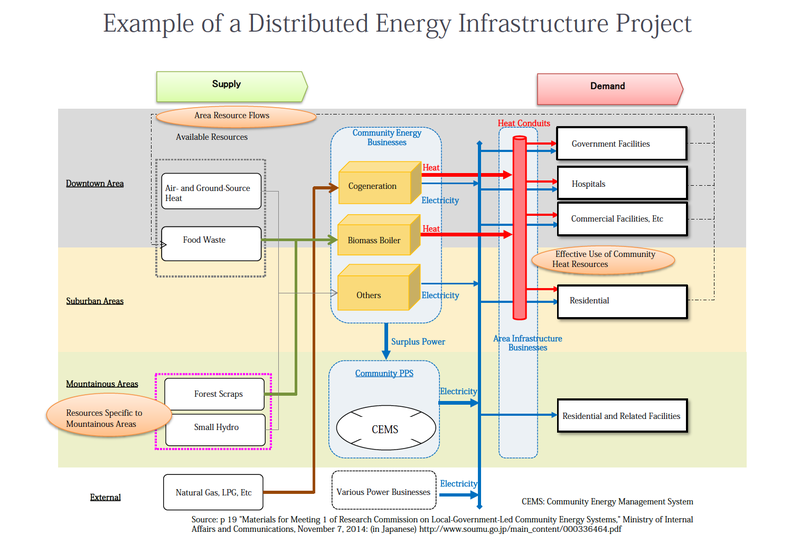 Figure 4 displays an “Example of a Distributed Energy Project,” showing the supply and demand parameters that the MIC-led committee aims at for local areas. The itemization of supply factors shows that energy inputs are diverse as well as geographically dispersed, spreading the economic opportunity across the community and out into the rural areas. As envisioned by the MIC, the local energy projects have their head offices situated in the local community and focus on developing local energy resources as well as local human resources. They also pull the investment from within the community as well as outside, and therefore make a significant economic contribution to the local area. In April of 2015, the Japan Research Institute’s Takiguchi Shinichiro reported in detail on the MIC’s initiatives. He noted that assessments of the benefits from this kind of energy development were based on Japan’s roughly 200,000-person population centers in all regions of the country (there are about 200 local areas nationwide with populations between 100,000 and 300,000 residents). One that is undertaking this kind of energy program is the city of Tottori in TottoriPrefecture. Takiguchi’s paper analyzed in detail the extent to which the benefits from this project extend beyond the city and throughout the prefecture. The calculation in Takiguchi’s paper assume (based on the German model of “stadtwerke” local public corporations) the local energy businesses to have a 20% share of electricity sales, with 40,000 residents (about 20% of all residents) serviced by the energy firm in 2030. In addition, public facilities and participating businesses are assumed to represent about 10,000 kW of demand. The result is that by 2030 power sales reach YEN 2 billion, and over the 15-year period 2016 to 2030 represent an average of YEN 1 billion per year. Moreover, assuming that 80% of the power is produced through cogeneration with a 50% efficiency of heat to power, heat sales over the 15-year period from 2016 to 2030 are an annual YEN 370 million. In other words, even under conservative estimates, a locally established energy business in a community of roughly 200,000 residents, one that installs both heat and power infrastructure, could provide an annual direct economic benefit of YEN 1.4 billion to the community. Infrastructure investment – spending on biomass, small hydro, cogeneration and other infrastructure – both within the city as well as in the surrounding area would amount to about YEN 500 million. In addition to the cogeneration of heat and power, investment in energy efficiency equipment to encourage the efficient use of energy is estimated to be roughly YEN 100 million. The above assumptions lead to a total direct economic benefit of about YEN 1.9 billion. This direct economic benefit leads to a YEN 600 million result in primary stimulus effect (the inducement of production internal to the prefecture). For example, substitution of locally sourced forest biomass for imported fossil fuel is a positive effect for the forestry industry. (This effect has been calculated on the basis of using biomass for 12% of fuel, which is a conservative assumption.) In addition, the local energy firm’s investments in power facilities and other construction also produce a stimulus effect. This economic stimulus is assumed to provide a YEN 400 million secondary stimulus effect to service industries (a production stimulus effect within the prefecture). Added together, the direct effect as well as the primary and secondary ripple effects are expected to amount toYEN 3 billion per year, or YEN 43 billion over 15 years, for Tottori City and its neighboring local communities. In terms of employment effects, the local energy firm directly employs about 80 people, with roughly 50 people employed through primary ripple effects and a further 30 employed through secondary ripple effects in the service sector. This leads to a total of 160 persons employed, and over 15 years of employment for just under 2500 people, a considerable employment benefit for the locality. Certainly there are new energy firms springing up. But they are overwhelmingly devoted to solar and too small to play a powerful role in investment as well as push back against the various stratagems of vested energy interests. An August 27, 2015 news release from Tokyo Shoko Research (TSR) indicates that between January and December 2014 there were 3,283 new firms created in the electric power industry. This represented an increase of 180 percent over the previous year, and nearly 50 times the 66 new firms in 2011. Yet the TSR survey also shows that 2536 (77.2 percent) of these new firms were in solar. Much smaller numbers were involved in other areas of renewable energy. Wind energy saw only 251 (7.6 percent) new firms. Small hydro attracted only 122 (3.7 percent) new business starts. And only 84 new firms (2.5 percent) were in biomass and other bio-related renewable energy business areas. There will clearly be a lot of destruction of power businesses in Japan, in the wake of deregulation. Whether it will be a Schumpeterian, creative destruction is an open question. So the LDP’s effort to make the community the engine of deploying renewable energy, by putting fiscal and institutional resources into the hands of local governments and their public corporations, is very promising indeed. The institutional changes, and their implications, do not stop there. In her September 4, 2015 policy statement, noted earlier, MIC Minister Takaichi pointed out that the ministry is assisting local governments in developing master plans. She described them as templates through which communities can not only make use of their respective energy resource endowments, but also take a leadership role in working with regional financial institutions and other actors in developing distributed energy infrastructure. As pointed out above, Takaichi also detailed that her ministry’s survey of its and other central agencies’ (METI, MAFF, and MoE) subsidy programs for the diffusion of renewable energy found that there are 31 separate programmes that totaled YEN 102.7 billion in fiscal 2015 on top of YEN 126 billion in the fiscal 2014 supplementary budget. As noted earlier, the Abe government has initiated a variety of policy streams, including “disaster-resilient community building,” “local revitalization,” “national resilience,” “distributed energy,” and several others. These programmes have received virtually no attention from enthusiasts of Abenomics, from Japanese liberal-left critics of the Abe, or virtually all other actors. Outside of specialist analyses that do understand the significance of these projects, and how they are coalescing on building robust smart communities, the reigning assumption appears to be that they are simply wasteful porkbarrel spending. The Japanese Cabinet office published the budget requests for national resilience-related expenditures for fiscal 2016 during the month of August. The total fiscal request for 2016 isa little over YEN 4.53 trillion, which represents a substantial increase over the previous year’s expenditure of slightly more than YEN 3.8 trillion. The amount devoted to public works in the fiscal 2016 requests is just under YEN 3.77 trillion, again a substantial increase over the previous year’s YEN 3.15 trillion expenditure in public works. The MLIT is the single largest recipient agencyin the budget allocation, as its appropriation is slated to total just under YEN 3.36 trillion, a 120% increase over the previous year’s figure of just under YEN 2.8 trillion. The available documents do not yet break down the MLIT expenditures into specific categories complete with numbers, the description of where the spending is directed highlights first and foremost measures to deal with the increasing threat of floods and landslides due to climate change and other factors. These measures to be taken in the face of flood and landslide threats from climate change are itemized as YEN 788.2 billion, a substantial increase over the previous year’s allocation of YEN 664.5 billion. It is not only MLIT that is to receive allocations for bolstering the nation’s communities and infrastructure in the face of natural disasters and other threats. Another significant recipient of funding is the MAFF. This ministry’s appropriations are second to the MLIT, and total YEN 545.8 billion for 2016, a 121% increase over the previous year’s allocation of just over YEN 450 billion. Some of the projects to which the MAFF’s funding is devoted include the production of “hazard maps” around ponds and reservoirs that are subject to flooding. The budget for this activity is the lion’s share of YEN 179 billion, which in itself is a significant increase over the previous year’s YEN 139.5 billion (in this case, the entire budget is not devoted to this particular allocation. The Japanese usage is “uchisuu,” which means “inclusive of” rather than a total per se). Other expenditures included in the MAFF’s budget is bolstering of afforestation to reduce disaster threats. One example is the strengthening of seaside forests to deal with such natural disaster threats as tsunami. This expenditure totals YEN 66 billion (inclusive), versus the 2015 total of YEN 55.8 billion (again, inclusive). An important expenditure category where both the MLIT and MAFF have significant expenditures is in the construction of roads and facilities to be used in the event of evacuation. The MAFF budget for this particular set of activities totals YEN 355.6 billion (inclusive), versus the previous year’s expenditure total of YEN 292.5 billion (again inclusive). The MLIT’s expenditure for roads and facilities to be used in the event of evacuation totals just under YEN 1.265 trillion (inclusive) for 2016, versus just over YEN 1.08 trillion (inclusive) for 2015. The evidence indicates that core elements of Abe’s Liberal Democratic Party (LDP) are increasingly enthusiastic about the potential for renewable energy and efficiency. After the March 11, 2011 (3-11) natural and nuclear disasters in the Tohoku region made “Fukushima” as notorious as “Chernobyl,” the pro-renewable faction’s numbers and influence expanded. With the exception of such LDP Dietmembers as Kono Taro,54 they are not opposed to nuclear power, which has rendered them politically invisible in the deeply polarized “nuclear vs solar” post-3-11 debate over Japanese energy policy and politics. But they are now quite openly using the power of the state against vested energy interests and on behalf of local governments and their residents. Japan’s evolving strategy seems a pragmatic response to extreme import dependence on energy (especially fossil fuels), vulnerability in the face of extreme weather and natural disasters, and the desperation of Abenomics. In addition, the powerful discourse of “disaster resilience” has presumably helped sell renewables and their associated networks (local grids, district heating, etc) within the conservative LDP. If so, it may also be helping to override opposition from the monopolies, the nuclear village, and other interests potentially threatened by the shift to local agency. In any event, it is certainly instructive, and encouraging, to watch Abenomics be driven in a potentially sustainable direction. 1 See Aaron Sheldrick and Issei Kato “Japan restarts reactor in test of Abe’s nuclear policy,” Reuters, August 11, 2015. 2 See, for example Japan Renewable Energy Federation Executive Director Ohno Teruyuki (in Japanese) “Coal-Fired Generation New Build is a Risky Business that Runs Contrary to International Promises,” JREF Natural Energy Update, June 11, 2015. 3 Note the comments from Japan’s Kiko Network and other observers cited in David McNeill “Japan’s emissions have soared since Fukushima nuclear disaster,”The Irish Times, September 21, 2015. 4 On this, see Steve Hanley “Japan Pushes Forward With Hydrogen Society Ahead Of Olympics,” Gas2, September 18, 2015. 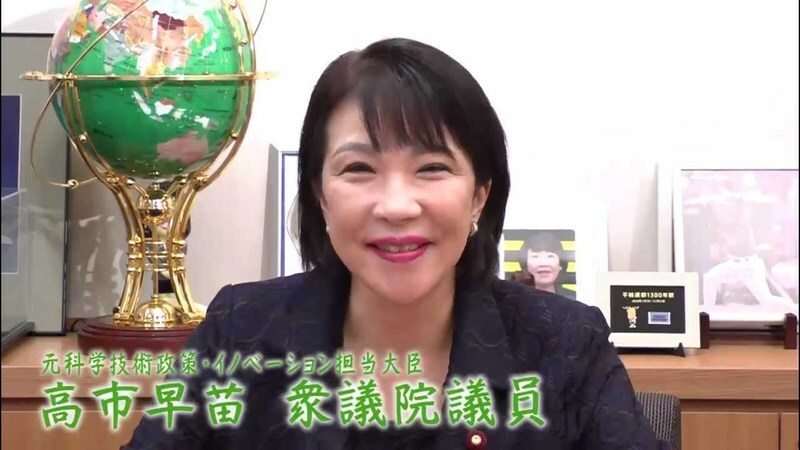 5 See (in Japanese) “Ministry of Environment 2016 budget for energy-related spending up 62%, for renewable and efficiency projects in local areas,” Kankyou Bijinesu Onrain, September 2, 2015. 6 See (in Japanese) “Initial budget requests at highest even YEN 102 trillion, with special account of YEN 3.8 trillion,” Asahi Shimbun, September 5, 2015. 7 See (in Japanese) “Japan Iron and Steel Federation presents requests for reductions in corporate tax burden in 2016 tax reform,” Nikkan Kougyou Shimbun, September 17, 2015. 8 On the taxes, and Japan’s green taxes in comparative perspective, see (in Japanese) Motoki Yuko and Naitou Aya, “Recent Developments in Japan and European Greening of the Tax System,” Mizuho Information Research Report Vol 9, 2015. 9 A thorough discussion of METI’s spending plans and institutional changes to enhance their effectiveness can be found (in Japanese) in Yoshioka Hi, “Subsidies for efficiency to YEN 126 billion: METI resolved to triple them,” Nikkei Ecology,October 2015. 10 On the use of renewable power to generate hydrogen gas, see the 4-minute video at “Power to Gas,” Deutsche Welle, June 28, 2015. 11 See (in Japanese) Ishida Masaya, “METI’s fiscal requests for 2016 centre on efficiency, with spending on energy overall at YEN 975.7 billion,” Smart Japan, September 1, 2015. The detailed METI request (in Japanese) is available here. 12 The B-DASH project is described (in Japanese) here. 24 On this, see BMI “Japan Renewable Report,” Business Monitor International, October 1, 2015. 41 A Japanese-language description of the programme is available here.